Conceptual models are the means by which a designer expresses his or her understanding of an envisioned information system. 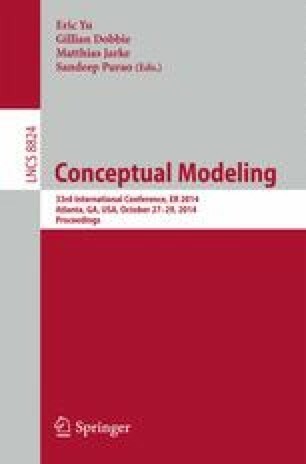 This research investigates whether modeling experts or novices differ in understanding conceptual models represented by textual descriptions in the form of narratives, by general-purpose conceptual modeling languages, such as entity-relationship models or by pattern-based conceptual modeling languages. Cognitive science theories on memory systems are adopted and a cued recall experiment carried out. The experimental results suggest that narratives cannot be underestimated during learning processes in information systems design. Furthermore, general-purpose conceptual modeling languages tend to lack capabilities for supporting template-based learning. The results are differentiated between subjects with at least basic conceptual modeling skills and novices.